After suffering from child abuse at the hands of his father, then domestic violence from his wife, Tony Lopez found excuses to turn to drugs. But it took his mother’s disdain to help turn him in the other direction and toward Soldier On. Strung out and needing shelter, Tony recalls going to his mom’s Connecticut home on a Friday night in 1999, seeking a place to crash for the night. A native of South Norwalk, Conn., and a Navy veteran who served six years as a jet mechanic on the aircraft carriers USS Enterprise and USS Coral Sea in the Pacific, Tony fought through his personal demons and addictions, and has remained drug and alcohol free since 1999. A resident of Soldier On since 1999, and a staff member since 2001, Tony has served Soldier On in many capacities from General Manager to coordinator of transportation, purchasing and facility maintenance. He is currently a full-time case manager for the Supportive Services for Veteran Families program in New York State, helping veterans to avoid the homelessness that he suffered following his military service. Tony left Connecticut shortly after high school to join the Navy in California, where he says he had no addiction issues (“just recreational stuff”) despite a long family history of substance abuse. His brother died from AIDS after sharing drug needles. He said his problems arose during a six-year marriage to an abusive woman with whom he fathered two children. He said he met her during his Navy service, and that when he sent home checks to pay for apartment rental, she was instead using the money to fund improvements to her mother’s house nearby. When he returned from service, he found himself living in a garage. He said this poisoned relationship continued even after he left the service and he found work as a jet engine mechanic in California. As he continued his drug use, Tony spent several years going back and forth between Connecticut and California, even traveling to England and China as an audio electronics technician. Recognizing his situation as an addicted, homeless veteran, Tony checked himself into several Connecticut treatment clinics before a clinician at the Norwalk Hospital pointed him to Soldier On. With addiction and homelessness now in his rear-view mirror, Tony rents a 3-bedroom home in the Berkshires and has reconnected with one of his sons. Air Force veteran Daniel Rine’s long travels have finally ended at a condominium in Pittsfield, shared with roommates and managed by the veteran support nonprofit Soldier On. On Christmas, the 34-year-old New York native was cooking food for 100 veterans. He assisted in the preparation of the prime rib and ham, and he worked with a staff of about a half dozen to provide an orderly Christmas dinner. “I have a reason to try and be successful and a means to do it,” said Rine, who couldn’t always say that. Rine is still young, but he’s already dealt with a lifetime full of personal challenges. He enlisted in the Air Force after graduating from high school, following in the footsteps of family members. He served a tour of duty at the Air Force base in Aviano, Italy, but was discharged after breaking down from the stress and homesickness. Rine temporarily lived with family members in California and New York before moving on. He boarded public transit, rode out of New York and arrived in Springfield by chance more than planning. Admittedly lost in life, Rine said he started walking the Massachusetts Turnpike toward Palmer before a police officer spotted him and provided him a ride the rest of the way. Over a five-year period life started to come together in central Massachusetts. He got a full-time job repairing air-conditioning units. He found love and got married. Then came the Great Recession. He lost his job. A divorce followed and Rine said he arrived at Soldier On an emotional wreck. The Air Force once provided for his needs. Now, he was living on his own, and reeling from personal turmoil. He needed some support. Soldier On provided it and imbued him with purpose. Over the last three years, Rine said he’s gone from the transitional shelter to an independent-living condo. He worked on the volunteer desk and then on the construction team, but he is most passionate about his current job in the kitchen. Rine believes he has the tools to improve his life further. 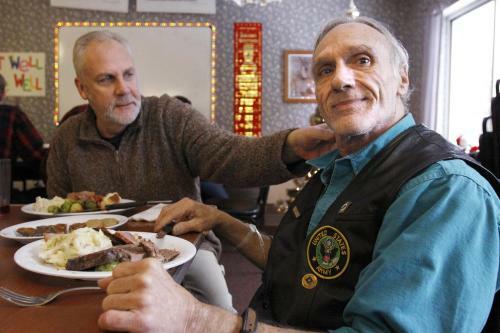 PITTSFIELD — Stomachs full after Christmas dinner in the dining hall at Soldier On, military veterans Jeff Harman and Ira Studley laconically shared the perilous road that made their simple meals worth savoring. No one comes to Soldier On, a private nonprofit organization that provides resources and supports for homeless veterans, without a problem to overcome, the day’s chef, Navy veteran Mike Davidson said. On Christmas Day, Harman and Studley both said they felt they had escaped death to enjoy this meal. While finishing with pumpkin pie and chocolate brittle, after a hearty meal of prime rib, Harman, 53, talked about dealing with depression and suicidal thoughts in the years following his discharge from the Navy and reserves after 19 years. Harman said he was let go because of “politics” and because he was overweight. “I was 285 when I went in and I left at 285,” Harman said. Studley, 67, said he’s been with the Soldier On program since Jan. 23, 2009. The Army veteran, who served from 1962-65, arrived after he hit life’s bottom. He was reluctantly divorced, had a gambling addiction, and was homeless after losing his house. After some thought, Studley said that if he wasn’t at Soldier On he’d probably be dead. Harman said the same was true for him. However, on Christmas, both veterans said that while they continue to deal with problems, they felt some of the worst is in the rearview mirror and they were putting some distance between themselves and their troubled pasts. Harman is happily serving as a baker at Soldier On, fulfilling a similar role he assumed in the Navy. He said he’s submitted an application to be head chef at a Soldier On facility in Agawam. Studley said he’s stopped gambling and embraced Christianity and the church. There was plenty of friendly chatter, warm gestures and appreciation shared on Christmas by troubled veterans, who were appreciative of a warm meal and friendly embraces from colleagues who understand life carries challenges. “I would rather be here rather than anywhere else,” said Navy veteran William Relation, who served from 1975-79. Davidson, the cook, said he expected to serve 100 instead of the 65 to 85 meals he normally serves. Pittsfield American Legion Post 68 also had a well-attended dinner for veterans. Army veteran Robert Adams was one of several volunteers lending a helping hand in the kitchen. He said he was treated for alcohol addiction last year, but now has his own apartment through the federal Section 8 program, and is enjoying a better life. Through life’s darkness, joys became sweeter, something Adams said he understood and many other veterans knew well. 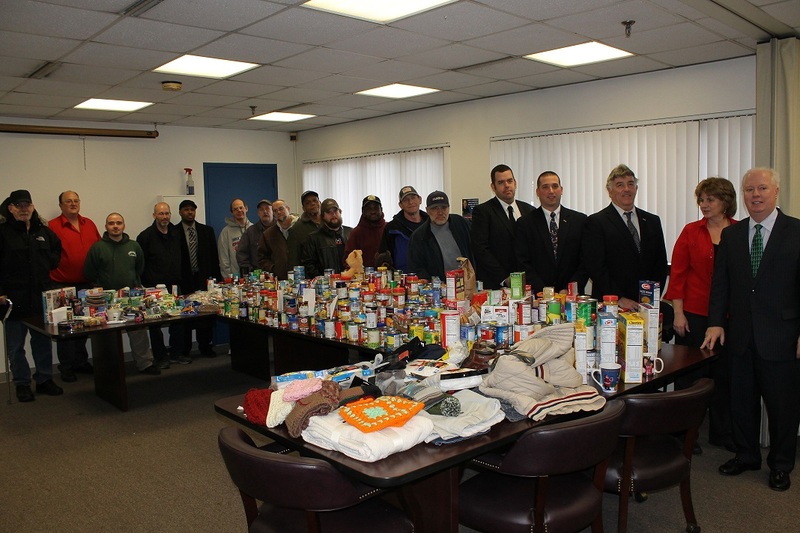 PITTSFIELD — Even more important than presents, some veterans received ample food and other gifts following a Berkshire Regional Transit Authority holiday gift drive. For the third year, BRTA accepted donations, such as food or clothes, in lieu of “B” bus fares during the first two weeks of December. The donations are then given to the veterans at Soldier On, the veterans support service organization. BRTA Director of Administration Tami Larimore said the donations this year nearly doubled what was received three years ago. This year, 675 donations were received, while 348 donations were received in 2010. “[The drive is] for those that have given so much, lost so much, and live with so little,” said Larimore, who created the program after seeing ample programs supporting children, but little to support those who served the country. “Christmas is not only for children, but all of us,” she added. Box after box of canned foods, which included everything from soup, corn, and spaghetti and meatballs, and some hand-knit clothes were packed in boxes by volunteers before being taken to Soldier On on West Housatonic Street for distribution. Soldier On provides food for about 50 families on a weekly basis, a representative said. This year’s drive was dedicated to former Army veteran Lenny Costa, who died of cancer in the spring after gaining employment at BRTA as a compliance inspector through a Soldier On program. Larimore said that even though Costa had only worked for BRTA for about half a year before he died, he was quickly embraced. “He left a mark in half a year that many won’t leave in 20 years,” Larimore said. Nuclea Biotechnologies and the national nonprofit Disabled American Veterans also provided gift cards. PITTSFIELD, Mass. — Only 17 percent of veterans at Soldier On have driver licenses; most of have lost their driving privileges because of struggles with alcohol or drug dependence. But now that they are sober, it is often too complicated to get their licenses back. Making that process easier would not only help the veterans get back on their feet but would also help even more people, veterans at Soldier On told Lt. Gov. Timothy Murray on Thursday. According to John “Jack” Downing, chief executive officer of Soldier On, of the organization’s $10 million budget, $800,000 is spent annually on transportation — gas, repairs and tires — for its 39 vehicles. Those costs set a minimum level of density a housing complex needs in order to be financially viable. For example, Downing said there have been talks with North Adams officials about opening a new locationthere, but it wouldn’t have the density needed to make transportation costs worth it. Getting veterans their licenses back would ease transportation expenses. Murray visited the site during a swing through the city to listen to the concerns of the program’s participants. He also visited Pittsfield High School in the morning to look at its STEM (science, technology, engineering and math program) and took a tour of General Dynamics, which was closed to the press. Veteran Tom Clark recapped the struggles many have had trying to earn their driver’s licenses back. Downing said the formerly homeless veterans don’t have the money to jump through all the hoops required. “It is so tedious, so difficult that people give up,” Downing said. Clark said he’s spoken with congressmen, the state delegation, the governor and now Murray, but no one has been able to help. Clark was diagnosed with obsessive compulsive personality disorder after his service and eventually landed in jail after nearly running someone over. Clark has multiple college degrees, and after going through counseling for his disorder, he feels ready re-enter the work force. “You can’t rely on our public transportation,” Farley-Bouvier said. Senior staff member Robert Reilly said the residents are talented but can’t turn their skills into employment because of the lack of transportation. Murray said he will contact Secretary of Veterans Services Coleman Nee and Registrar of Motor Vehicles Rachel Kaprielian to see if there are ways to smooth that transition. “The practical solution is having our Department of Veterans Services work more strategically with the Registry of Motor Vehicles to help veterans. That’s something that doesn’t cost any money, it is just getting people to work together and smarter,” Murray said. Finding ways to “work smarter” was one of the goals Murray had in multiple stops in Pittsfield on Thursday. The state’s revenue has come up short and cuts to the budget are looming. However, Murray reiterated his support for veterans housing, which mixed two of his roles as chairman of both the Interagency Council on Housing and Homelessness and the Advisory Council for Veterans Services. “We’ve had much more difficult budgets than this year and I think the standards in which we make decisions are the same. We protect safety net programs, programs that serve our most vulnerable populations and programs that serve out veterans,” Murray said. With hundreds of soldiers returning from Iraq and Afghanistan, Downing said the need for programs such as Soldier On is growing. He is confident that state and federal government officials recognize the need and will continue to support programming. “They both know transitional housing doesn’t work,” Downing said of Murray and Farley-Bouvier. In closing a roundtable with veterans, Murray said the state has “the best programs in the country” and promised that the administration will continue to be “aggressive” in keeping that prestige. “Soldier On is one of the best in helping veterans and their families in a real positive way,” Murray said. Click here to view the story and photos from Lt. Gov. Murray’s visit to Soldier On.